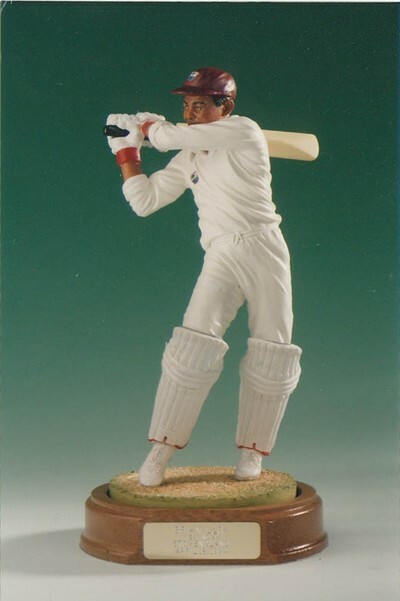 A superb figurine of Cricketing legend, Brian Lara. Brian Charles Lara (Also Known As "The Prince of Port of Spain") is a Trinidadian former international cricketer and widely acknowledged as one of the greatest batsmen of all time. He topped the Test batting rankings on several occasions and holds several cricketing records, including the record for the highest individual score in first-class cricket, with 501 not out for Warwickshire against Durham at Edgbaston in 1994 and he also holds the record for the highest individual score in a Test innings after scoring 400 not out against England at Antigua in 2004. He is the only batsman to have ever scored a century, a double century, a triple century, a quadruple century and a quintuple century in first class games over the course of a senior career. Brian Lara has also endorsed a series of six cricket video games; published by Codemasters.